Once you've made a flagship supercar, you would normally leave it at that and work on something else. But that's how Mercedes-AMG works. 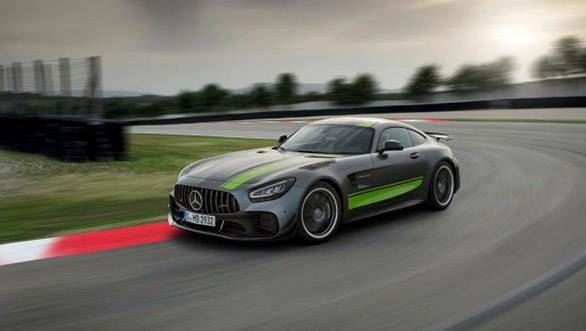 The German automobile brand has unveiled a more "exciting" version of the GT and are rightly calling the GT R Pro. They have also updated the GT range with tons of updates. In official words, "A lot of experience from our current GT3 and GT4 motorsport activities entered into its development. The agile responses to all driver commands and the overall performance now deliver even more of that incomparable feeling that our racing drivers experience on the track," said Tobias Moers, Chairman of the Management Board of Mercedes-AMG GmbH. The 2019 Mercedes-AMG GT comes with a tri-functional, arched light guide takes on the functions of daytime running light, navigation light and turn signals. Mercedes mentions that the multi-chamber reflector system with three single reflectors each for dipped beam and main beam does not only ensure optimal illumination of the road but also make the overall layout sportier than before. Further, the 2019 AMG GT comes with a new rear apron, black diffuser insert that has been redesigned for the AMG GT, AMG GT S and AMG GT C models. The tailpipe cover has been completely redesigned to match the shape of the AMG GT 4-door coupe. The AMG GT now has two round twin tailpipe covers, the AMG GT S and AMG GT C has trapeze shaped twin tailpipe covers. The AMG GT R gets centrally positioned tailpipe cover with centre bar. It is flanked by two more black tailpipes on the left and right of the diffuser. The AMG GT and AMG GT S can be optioned with a new lightweight y-spoke alloy wheel in soft black with a finely polished surface. The AMG GT, AMG GT S and AMG GT C also comes with the new 10 double-spoked forged wheels in titanium grey. In terms of equipment, the 2019 Mercedes- AMG GT S and AMG GT C's steering comes with a wheel black nappa leather/Dinamica microfibre while in the AMG GT R, the rim is covered in Dinamica microfibre. The AMG steering wheel also comes in black nappa leather with trim in black piano gloss, as well as Dinamica microfibre with elements in high-gloss carbon fibre. The cabin also boasts of integrated touch control buttons that can be used to control the functions of the digital dashboard and the multimedia display by means of horizontal and vertical swiping of the finger. The active distance assistant Distronic and the Tempomat cruise control can be adjusted on the control panels on the left. The control panels on the right are used to activate the voice control and telephone, to regulate the volume as well as other functions of the multimedia system. The AMG drive programmes can be triggered via the controller. The selected setting is shown on the colour LCD display directly integrated in the controller. 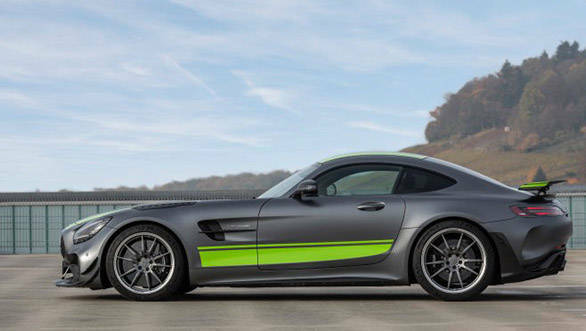 The new limited-edition top-of-the-range AMG GT R Pro gets further improved driving dynamics, in particular on the racetrack. Mercedes mentions that the experience from the AMG GT3 and AMG GT4 racing cars have been used into the development of the AMG GT R Pro. The measures from motorsport can be clustered in four areas: suspension, lightweight construction, aerodynamics and looks. The new AMG coil-over suspension now offers more choices for adjusting the set-up to any particular circuit. Similar to the track-spec cars, the driver can not only set the spring preload length mechanically, but can now also adjust the compression and rebound of the dampers. This is done with a click system with an integral adjustment dial on the damper. The compression rate is adjusted separately for high-speed and low-speed movements. The front axle is fitted with an adjustable torsion bar made of lightweight carbon fibre. Its counterpart at the rear is made of steel, is likewise adjustable and also saves weight due to its hollow tube design. The AMG GT R is already fitted with Uniball spherical bearings at the lower wishbones of the rear axle. The AMG GT R Pro now gets these bearings for the upper wishbones as well. They are significantly more wear-resistant than conventional wishbone bearings and have no play owing to the design, which means toe-in and camber do not change even under high loads. The carbon-fibre shear panel in the underbody of the rear end also contributes to the better handling. 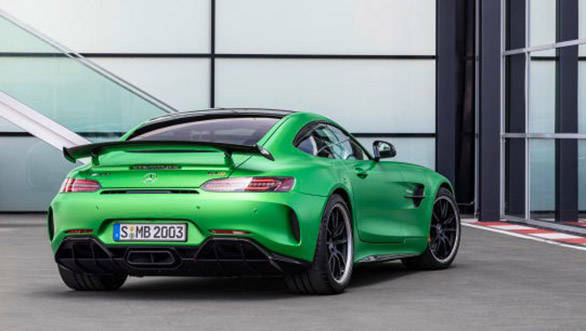 This lightweight and rigid element stiffens the rear-end structure and as a result adds even more stability to the body shell, mentions Mercedes-AMG. Weight saving is crucial in a car like this. It has been done with standard-fit ceramic high-performance compound braking system exclusively with black painted brake callipers as well as by the AMG bucket seats made of clear-coated carbon fibre. It also gets lightweight AMG Performance five-double-spoke forged wheels that are exclusively painted titanium grey and feature a rim flange with high-sheen finish. 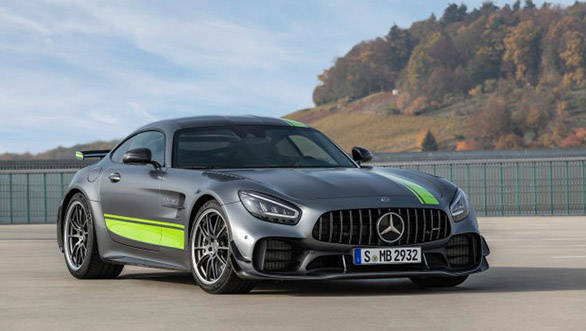 The 2019 Mercedes-AMG GT R Pro also comes with the Track Package (not for USA, Canada and China). It comprises a roll-over protection system, enclosed 4-point safety harnesses for driver and front passenger, and a 2-kg fire extinguisher (both scopes exclusively for use on the racetrack). The bolted steel roll cage of the roll-over protection system consists of a main roll bar, a brace to mount the harnesses, two rear braces as well as a diagonal X-brace in the rear end. The system further increases the already excellent vehicle rigidity and thus also has a positive influence on the vehicle's driving dynamics. 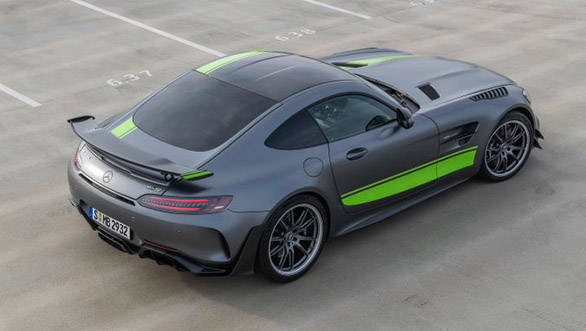 In the USA, Canada and China, the AMG GT R Pro is fitted with matte carbon-fibre trim elements and the boot brace in place of the Track Package. The 2019 iterations make use of a 4.0-litre twin-turbo V8 that puts out 476PS in the GT, 522PS in the GT S, 557PS in the GT C and an impressive 585PS in the GT R Pro. The torque out for these models range from 630Nm for the GT to 700Nm for the GT R Pro. 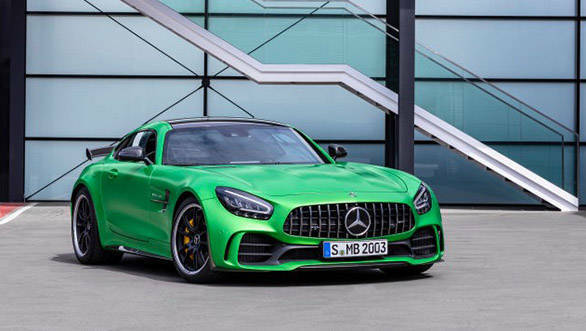 The quickest and the fastest in the GT family and for obvious reasons is the GT Pro that takes an impressive 3.6s to touch 100kmph and can reach a maximum of 318km while that of the AMG GT is 4s with a maximum speed of 304kmph. In early November, AMG brand ambassador and AMG GT3 racing driver Maro Engel completed a circuit of the Nurburgring North Loop in exactly 7.04.632 minutes driving a still disguised AMG GT R PRO. 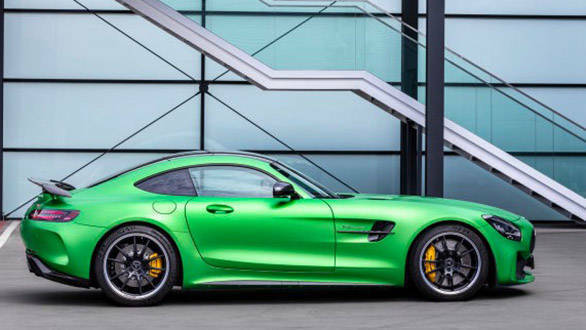 This considerably bettered the previous time for the AMG GT R.